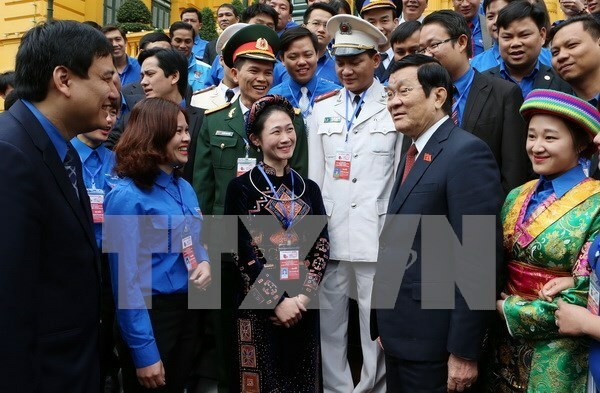 Hanoi (VNA) – The Party and State consider the role played by youths important and encourage them to take a greater part in national defence, construction and development, President Truong Tan Sang said. The leader made the statement at a March 25 meeting with 85 outstanding youths who would be honoured with the Ly Tu Trong Award by the Ho Chi Minh Communist Youth Union Central Committee (HCYUCC) at a ceremony in Hanoi later the same day. Young people should equip themselves with more ideals in order to make greater contributions to the country, he said. Hailing the awardees for their performance in the youth union, President Truong Tan Sang urged them to carry forward their talent and enthusiasm in studying, as well as in youth-union-related activities. Youth union officials need to pay more heed to the building and actualisation of guidelines and resolutions in order to reap better results, he said. The youths made a range of proposals to the President and the HCYUCC Secretariat in a bid to remove difficulties hindering youth union work. Since its inception 11 years ago, the award honoured 886 union officials and members at different levels who have made noted achievements in all fields. Among this year’s awardees, there will be eight ethnic minority people.